Announce the 2009 Design Competition Winners! Twenty-four designers submitted a remarkable assortment of innovative boat concepts. Entries ranged from basic sketches to bound books of design calculations and drawings from a PhD naval architect. 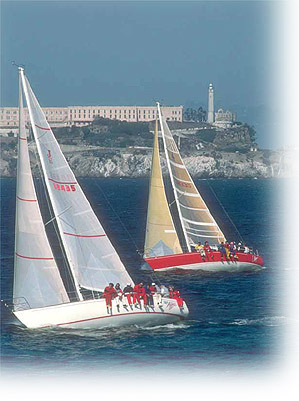 Boat sizes ranged from 31 feet to 78 feet, and were both monohull and multihull. Construction materials ran the gamut from fiberglass to aluminum to wood/epoxy and steel. After the initial weeding-out process (all judges looked at every boat design submitted), there were eight potential finalists vying for top honors. Each of these was put on the drawing table as all the judges reviewed every sheet for each of these designs. One by one, the remaining entries were winnowed down until three finalists were left. Though the judges had now eliminated twenty-one of the submitted designs, there was universal agreement on the designs eliminated as well as on which three should be in the top three. From here, the process was more challenging. It would be hard to imagine three more completely different designs those that were sitting on the finalist’s table: a 49-foot, slender-hull power tri; a 44-foot monohull with traditional styling; and a 32-foot lobster yacht with a hard-chine hull. Each design had supporters among the judges, and intense debate ranged about their merits and drawbacks. Yves-Marie de Tanton’s LST.32 hard-chine hull lobster yacht took top honors. The judges were impressed that the design met all the criteria in one of the smallest and thus least expensive packages. Not only does the boat have good deck access (with stairs gentle enough to even be used by a large dog) and a large outside fly-bridge deck with helm station, but the interior arrangement has a generous forward master stateroom with enclosed head and a completely separate shower. The pilothouse saloon has a usable though compact galley with a comfortable dinette/settee berth that will really seat four for a meal. Further, the boat has an aft cabin with a washer drier—a real boon for the live-aboard cruiser. The single aft berth extends to form a double, so another couple can join Jane, Bob and Bart for weekend cruises with their own private cabin. The LST.32 gets quite a lot out of a small volume, and the smaller size not only reduces initial cost, but makes maneuvering in tight spots on inland waterways easier. The judges reservations about the LST.32 were minor—dinghy handling was acceptable, but interfered with the use of the swim platform, and—though a good-looking boat—it struck most of the judges as somewhat high in appearance relative to its length. This, however, is almost an inevitable result of working so much into 32-foot LOA. In fact, Tanton notes that the high profile requires a bow thruster (included in the design) to insure good handling in a stiff breeze during docking. The bridge clearance of 19-feet 5-inches will pose some issues on inland waters. Karl Stambaugh’s Redwing 40 Hybrid struck almost all of the judges as the most attractive of the designs submitted. Though 8 feet longer than the Tanton LST.32, the Redwing 40 is actually nine inches narrower and has just 4 inches more draft. Bridge clearance, is considerably lower than the LST.32. In fact, with 12-foot 6-inch bridge clearance the Redwing 40 will go under many bridges without waiting for them to open. Lowering the mast would reduce bridge clearance to just 8’ – 9”. Initially, several of the judges felt quite strongly that the Redwing 40 Hybrid should be the winner. Being larger, though, this boat will cost more and so everything would have to really be spot on throughout this design to justify the extra expense. Though the Redwing 40 Hybrid, was the personal favorite of several judges—after accounting for a few minor issues—this design’s score on the final-criteria judging sheet came in behind the LST.32. Triple Threat—a 49-foot modern power trimaran with slender hulls—impressed all the judges with its bold innovation and handsome styling. It’s rare to see a truly fresh and different boat design that six completely independent judges all agree is handsome and inarguably unique. Triple Threat accomplished just that, no mean feat! Further, all the judges were impressed with how carefully and sensibly thought out this unusual concept was. It is quite a difficult design challenge to work in usable accommodations in the odd form and tight spaces of a trimaran of this size with its very slender hulls. Designer Jon Ames accomplished just that. All the judges concurred that this design would be the most expensive of the three finalist deigns. Indeed, none of the judges believed Triple Threat could be built for under a million dollars. This is not a design fault. It’s a necessary result of the complexity of the multiple hulls, as well as the intricate superstructure and the lightweight, composite construction required. The cost plus a few details was all that kept Triple Threat from the top spot. Or see the January 2010 issue of PassageMaker magazine. Click Here to read comments from some of the judges on PassageMaker’s website. Imtra Marine Lighting is a leader in the design and manufacture of lighting for boats and a pioneer in marine LED lighting. Safe, dependable, and long-lasting, Imtra’s eco-friendly “green” LED lighting includes spots, fixtures, reading lights, courtesy lights, chart lights, engine rooms lights, and other LED products. Combined with its extensive line of switches, dimmers, and transformers, Imtra offers a complete one-stop-shop for marine lighting and delivers the most advanced solutions on the market. For more information, visit www.imtra.com.